When not just any speakers will do, turn to super speakers that seem to do it all. JBL EON612 powered speakers are portable powerhouses in their own right, offering Class D amplification for 1000 watts peak power, JBL's advanced waveguide technology for smooth dispersion, impressively high SPLs, and Bluetooth integration for studio-quality sound that you can control anywhere. JBL's EON series of powered speakers have long been a noteworthy value in portable PA systems, and the redesigned EON612 takes the EON up another notch! This versatile, self-powered, two-way, bass-reflex speaker system offers a 12-inch LF driver and 1000W peak power or 500W continuous power. For critical live sound applications or your basement practice space, this set of powered speakers delivers transparent, high-volume power and consistent coverage for full-spectrum sound across all genres. 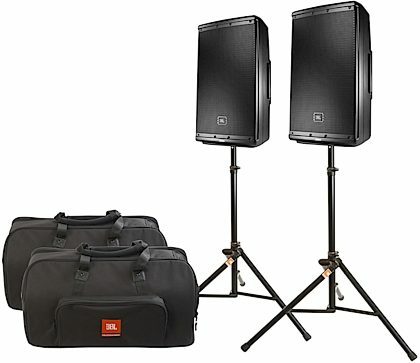 Uniform sound comes courtesy of JBL-designed and manufactured transducers, along with JBL waveguide technology, which uses waveguides to control sound quality at low frequencies, the crossover point, and high frequencies. Want smooth, even sound no matter what? With the EON612, you got it. Its Class-D amplifier design keeps the overall unit relatively lightweight and compact, while well-placed handles help you carry the EON612 from van to venue. Indexed feet molded into the enclosure provide welcome security when stacking multiple units on stage. And when stage space is seriously tight, integrated hardware mounts let you fly the speakers. The EON612's DSP EQ parameters may be adjusted onboard or from your mobile phone or tablet via Bluetooth. If the sound check doesn't catch everything and you need to tweak your tone mid-performance, you can do it from afar without interrupting the show. Conveniently, the speaker system's Bluetooth interface supports both iOS and Android devices. Easy to transport and set up, JBL EON612 powered speakers provide high-end, high-power sound for a range of applications. More than just another sound system, the EON612 is a true step forward in technology developed specifically to deliver the best sound possible regardless of its application. Completely rethinking the self-contained, portable PA system, JBL engineers purposely designed and built the EON612 from the ground up featuring JBL's advanced waveguide technology, JBL-designed and manufactured transducers, and convenient, wireless remote control of its onboard DSP EQ parameters via Bluetooth. This total redesign of the EON platform leverages the technologies in cabinet materials, acoustic science, transducer design and user friendliness that delivers the extraordinary quality of a high-end studio monitor in a fully professional, highly flexible, easy to use, portable system for today's working musicians and sound providers. Overall: I received these speakers on Wednesday and used them for the first time on Saturday. Came through with flying colors! Obscenely loud but I ended up keeping the volume at 12 o'clock (mid way) and the master at 2 (from one to ten). No issues whatsoever. The EQ presets in the back definitely make a difference depending on what you use these for. These are a great value! I've used JBLs in the past (JRX series) and have regretted selling them ever since, so when I saw these, I jumped on them. Very light - can carry both at once and I'm 63! Buy a pair and save a few $$. You won't regret it. BTW - zZounds has officially become my favorite music store. I ordered these on Tuesday at 3:30 in the afternoon and they were at my door less than 24 hours later! How is that possible?? Plus, the payment plan is a lifesaver! Love this place. Style of Music: Many styles - Americana, folk, Classic Rock, Country, GB. Overall: Got this to replace and old Mackie that died a slow and painful death. The JBL Eon series is a very good choice for live sound applications. I'm using this speaker for a monitor and it does the job well. Nice clean sound with plenty of power. Build quality is very good. The bluetooth feature is an added plus. Have not needed manufacturer support so far.